Explanation: Snowy Mont Blanc is near the centre of this atmospheric night skyscape. 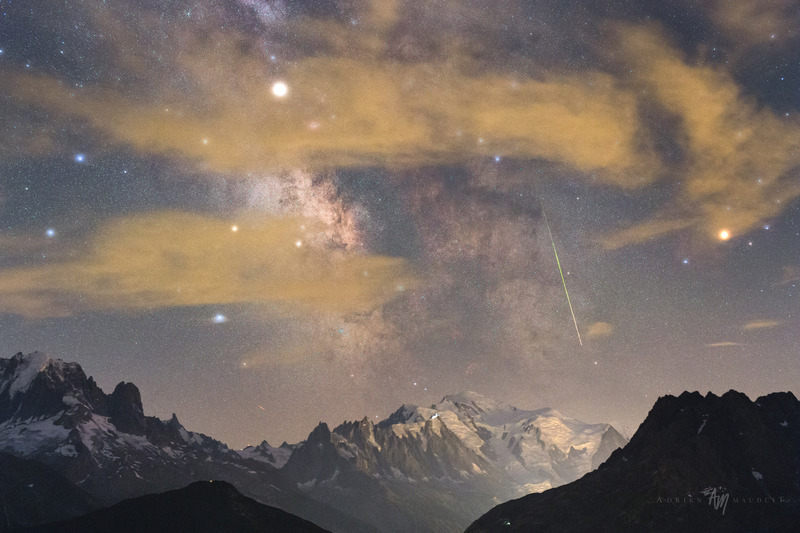 But high, thin clouds fogged the skies at the photographer's location, looking south toward Europe's highest peak from the southern Swiss Alps. Still, the 13 second exposure finds the faint star fields and dark rifts of the Milky Way above the famous white mountain. Bloated by the mist, bright planet Saturn and Antares (right), alpha star of Scorpius, shine through the clouds to flank the galaxy's central bulge. The high-altitude scene is from the rewarding night of August 12/13, so it also includes the green trail of a Perseid meteor shooting along the galactic plane.